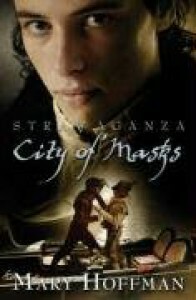 City of Masks had all the elements to be a great story. Take one hero with cancer that can time travel to another world that resembles 1600's Venice. When he's in this other world, he is somehow well and strong again. Add in a cute girl his age that he gets into random adventures with, and we have a recipe for success, right?In theory, this story should have been AMAZING. While I enjoyed the book and will eventually get around to reading the second in the series, there was something missing that I couldn't quite put my finger on. Maybe I wanted more action...maybe I wanted more romance...maybe I wanted more "oomph. "For me, the character of Lucien just fell a little short of interesting. I felt like I never really got to know who he was outside of falling in and out of his present day life in London, and then back to his other life in Bellezza. Half of the book felt like he was falling asleep in order to get where he was going, and then having to hurry back to his sleeping body in time to make it back before his parents got suspicious.The part of the book that really redeemed itself for me were the last few chapters. I found myself tearing up as Lucien was forced to let go of loved ones. The author handled Lucien's loss with an element of flair, showing us just how the lines of reality can be blurred between one world and the other, allowing us to glimpse how his life might be from both sides of the mirror.